I'm back with another project for Trendy Twine. This month's featured twine is Orange Truffle. I LOVE THIS COLOR! I think this is my favorite project I have done as part of the Trendy Twine Team. So let's get to it! I started with a craft cardstock base measuring 4" by 8.5". I scored it at 4" and 4.5" creating a 4" mini book with a spine of .5". I inked the edges with Seedless Preserves Distress Ink. I cut the patterned paper at 3.5" x 3.5", inked edges in brown and glued down. I used the Belinda's Borders stamp set from Lawn Fawn to stamp the stitching in brown around the edges of the book. 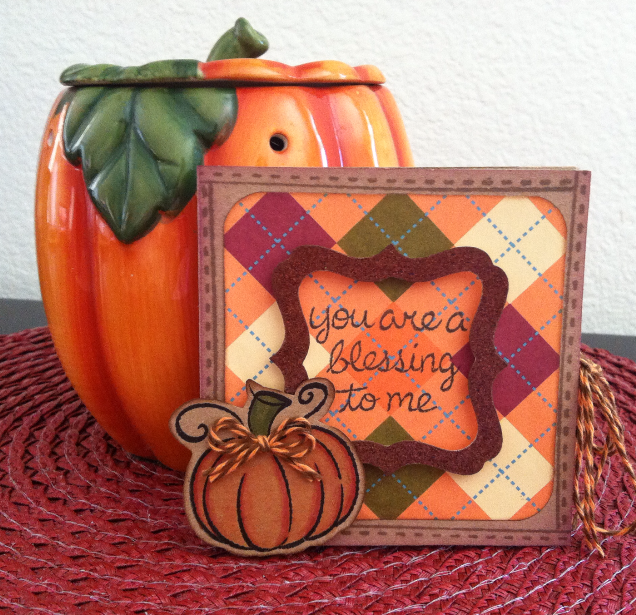 I used the Harvest Season stamp set also from Lawn Fawn to stamp the sentiment in the center of the cover. I cut the frame from brown glitter cardstock using my Cricut and popped it up on foam dots. The pumpkin is also from the Harvest Seasons set. I stamped it on craft cardstock and colored with Tim Holtz markers. I cut it out, popped it on foam dots, and embellished it with a double bow of Orange Truffle twine. The twine closure was done by gluing down a double strand of twine on on each side of the inside cover, making sure they are even so they can later be tied in a bow to close the book. I then cut two craft cardstock squares just under 4" to glue to the inside of the book and cover the twine. This really was so fast and so fun! I plan on making more of these tiny books for my family members for every season. I hope I have inspired you to give it a try. Thank you so much for visiting my blog today. Please visit the Trendy Twine blog and join in this months challenge. It's a lot of fun. Have a great crafty day and come back often for more crafty inspiration! What a pretty card!! Love the kraft colour! Great work this month! What a great minibook! Looks wonderful! Adorable Kerri. Great Faux stitching too. It's one of my favorite colors too! Great little book. Love the pumpkin stamp. Such an adorable project! Love the idea of a mini book! Such a beautiful project and very sweet, too. I love the idea of it being for photos of this special season.